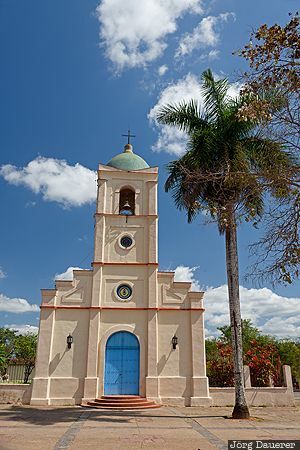 The church Iglesia del Sagrado Corazón de Jesús in Viñales below a blue sky with some clouds. Viñales is in the province Pinar del Río in the west of Cuba. This photo was taken at around noon on a sunny day in February of 2016. This photo was taken with a digital camera.